In this week’s SEO roundup, we have a few interesting updates from Google. The search giant is known to continuously work on improving user experience by making the design improvement to its search services. 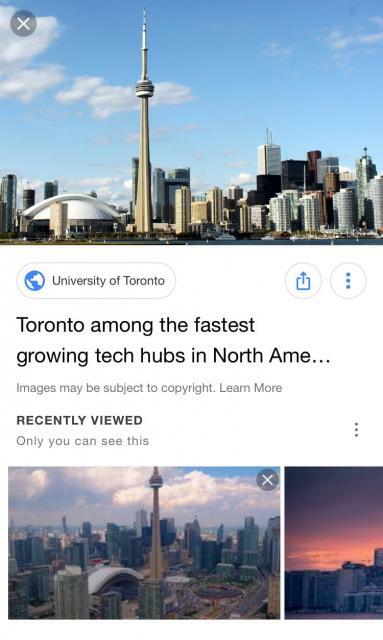 Google added the feature to display the recently viewed images to the Image Search that shows the images you have previously viewed and are related to the one you are currently looking at. Here is a screenshot shared by one of the users on Twitter where you can see the recently viewed section in the image preview. This change can point towards early changes in the Google Image Search. 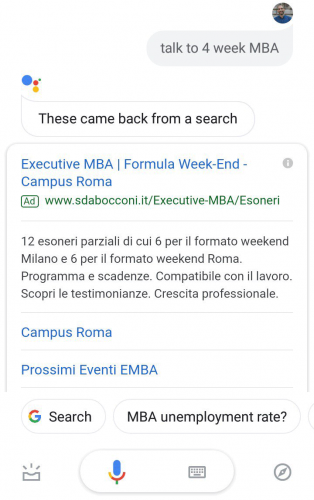 Honestly, it’s not a surprise that Google is testing ads for its Assistant service. The voice queries are the future of internet search and companies like Google has to come up with ways to monetize voice search results. For mobile users, the Google News search has not made a new form of snippet feature available that allows users to browse the related coverage in the expanded section. This is it for this week’s SEO roundup. All these updates are not affecting the SEO principles and practices in any way, but they are important to be taken into account. This is the first SEO roundup for the first week of February 2019. Can you believe it one month of the New Year has already passed! 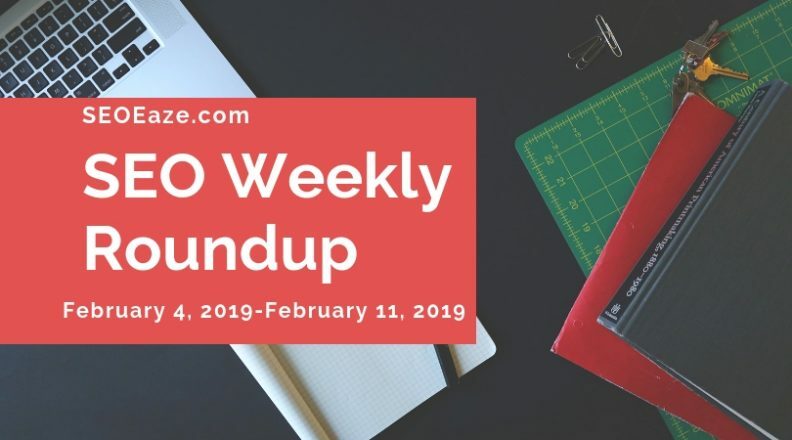 Moving on with our weekly SeoEaze’s SEO roundup, Google Search Ranking Algorithm showed signs of an update on February 7th. It is hard to say what websites are mostly affected by this minor update, however, most of the update signs are coming out of the United Kingdom. If you have witnessed any change in organic rankings or traffic for your websites, most probably it has happened because of this update. Last week, Bing remove URL submission restriction on its Submit URL tool from 10 URLs per day to allow 10,000 URL submissions per day. This is a move as announced by the search engine to do away with the crawling as a strategy to include web pages into their index. In an interview with Christi Olson, Head of Evangelism at Bing confirmed that this is the direction Bings hopes to move towards. According to her, crawling URLs is both ineffective and resource intensive for both Bing and the publishers. Instead, the new strategy will let the publishers submit their content to the search engine. Yes point and feedback taken. Crawling isn't going to stop – this is a signal for new and fresh/updated data to be included in the index. To fully utilize the new strategy Olson recommends that publishers should start using this function NOW. This will allow a lot faster crawling and indexing of the content. This makes way for the biggest update for content creators who use the Yoast SEO tool with WordPress. At YoastCon, Joost de Valk that the popular Yoast SEO plugin will start offering live indexing with both Bing and Google from the next month. For Bing, the plugin will most probably be using their newly introduced submit URL API. As far as Google is concerned it is still not clear how this feature will work. On the official Yoast blog, it is pointed out that “For Google, the details on this are not entirely determined yet, but a Google Search Console account will probably be required.” We expect it will have something to do with Search Console. In this week’s SEO roundup, we will cover some of the important revelations made by Google’s John Mueller during the hangout sessions with SEOs. First one is the upcoming changes in Google Image Search that will force you to think differently. During a session with webmasters on 24th January, John Mueller told that there are some really big changes coming to the Google Image Search this year. These changes will force you to think differently about image optimization than you have been doing for the last two decades. Moving on to the next update, Google states that the last 50% of the Mobile-First Indexing migration will be harder. Till not Google has migrated 50% of the search results towards the mobile-first indexing mechanism that evaluates the value of web results based on their mobile friendliness. But the last 50% is still left to be migrated and it is going to be much harder for Google to migrate over. According to John Mueller, the problem is between the mobile and desktop versions parity that is causing issues with migration. The challenge is to fix the mobile pages that have a difference in terms of content, structure data, links, etc. as compared to their desktop versions. Google is planning to communicate with the webmasters via Google Search Console regarding the issues that need to be fixed for successful migration of their websites. Still, John believes there will be a number of websites that will never be mobile-first. This last one is a tip that can help you improve trust value of your website for Google. That can definitely be the case. So it’s something where our algorithms when they look at it and they see oh there’s a bunch of really bad links here, then maybe they’ll be a bit more cautious with regards to links in general from the website. So if you clean that up then the algorithms look at it and say oh there’s kind of it’s okay, it’s not that bad. I think if you’re in the case where it’s really clear that the webspam team you would give you a manual action, then based on the current situation then that’s what I would disavow. You can check the complete discussion in the video above. Search Engine Optimization intends to enhance the website rankings in a fair manner and get more and more traffic for your website. But, many of the website owners make mistakes regarding their website optimization and act as self-destructors for their website rankings and traffic. 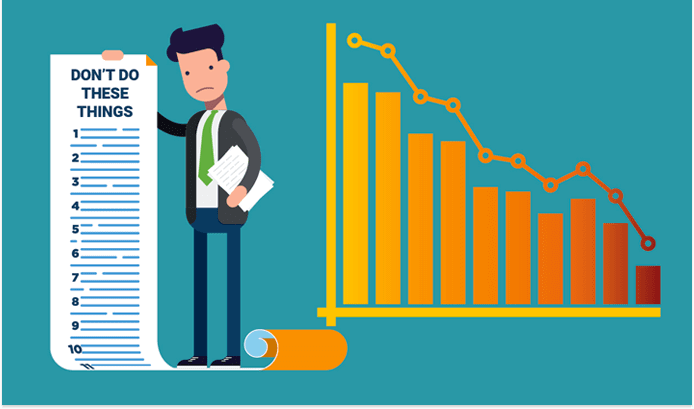 Here are some of the mistakes that have a massive impact on your website rankings. Most website owners believe that using Google Keyword Tool is a kind of cheating and that the tool provides just queries you can use to frame the content. But the fact is, Google Keyword Tool gives sufficient choices to elect long tail keywords and include them in the content to enhance the traffic for your website. Not using the Google Keyword Tool is one of the biggest SEO mistakes since with this tool you can understand much about the choices of the users while surfing the internet and their popular searches about a particular topic. This will help you to know your users better and include the keywords in your content that can gain you more traffic and searches and improve your website rankings. We are here with the first weekly SEO roundup for 2019. The first week of January had no updates for the SEO community, primarily because of the holidays. However, on January 9th there were signs of a Google search algorithm update. Since January 9 there have been pretty much unstable rankings in the Google search results and it is picked by the automated tracking tools. The update is continuing on and you can experience changes in your website’s search results over the following weeks. There has not been any official confirmation from Google on these updates but the ranking fluctuations are evident. Moving on to the next update, in a recent webmaster hangout session with SEOs, Google’s John Mueller hinted towards discontinuation of some old Search Console features. Earlier in February last year, Mueller has said that all the features of old Search Console will be ported to the new one, but now it is said that some of the old features will be discontinued for sure. John listed the crawl errors sections as an example feature that will be removed as it is not useful. John listed one example, the crawl errors section will be going away because it is not useful. Google also might do away with reports that third-party tools have and are redundant to what Google offers. It is not 100% clear. On the Search Console side there lots of changes happening there of course. They’ve been working on the new version. I imagine some of the features in the old versions will be closed down as well over time. And some of those might be migrating to the new Search Console. I’m sure there’ll be some sections of Search Console also that will just be closed down without an immediate replacement. Primarily because we’ve seen there’s a lot of things that we have in there that aren’t really that necessary for websites. Where there are other good options out there or where maybe we’ve been showing you too much information that doesn’t really help your website. So an example of that could be the the crawl errors section where we list all of them and millions of crawl errors we found on your website. When actually it makes more sense to focus on the issues that are really affecting your website rather than just all of the random URLs that we found on these things. And in the last update this week, Google will remove the comments feature from the Webmaster Blog. Google Webmaster Blog will no longer have the ability to post or view comments as announced by Gary Illyes on the blog. He reported that most of the comments were off topic, even some being outright spammy. This is a step to save time spent on moderating the comments. Google is not redirecting users who want to comment to the help forums or their Twitter accounts.